For his contribution to abstract art, Piet Mondrian is regularly regarded as one of the most influential artists of the 20th century. But there's much more to this Dutch painter than the seemingly simple lines and color blocks of his best-known works. 1. Mondrian is celebrated as a founder of De Stijil. This Dutch art movement of the early 20th century translates to "The Style." De Stijil also referred to a group of artists and architects who pushed abstract art into focusing on simple forms like lines and blocks, painting in black, white, or primary colors only. Mondrian's fellows in this collective were Theo van Doesburg, Vilmos Huszár, Bart van der Leck, Gerrit Rietveld, Robert van 't Hoff, and J. J. P. Oud. 2. It may look straightforward, but his work was spiritual. 3. His path to abstraction was painted with tradition. Though the De Stijil group was dedicated to the "absolute devaluation of tradition," this theory evolved only after much exposure to tradition. 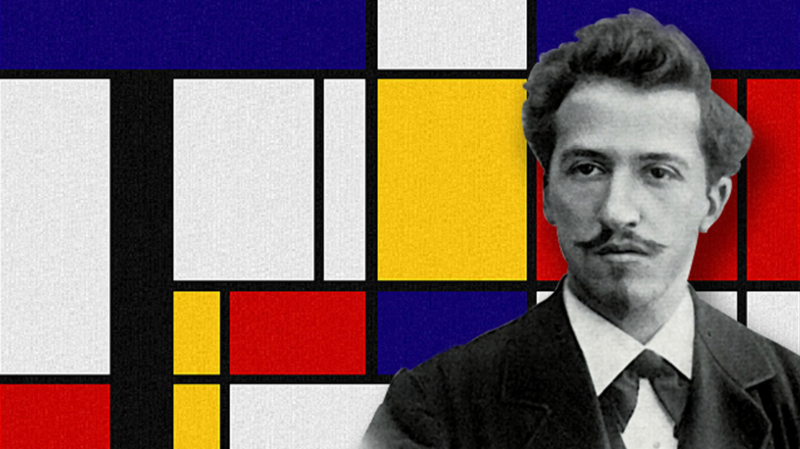 Raised in a home where his parents encouraged his creativity, Mondrian was first taught to paint by his uncle, Frits Mondriaan, a well-reputed artist. The Dutch student went on to study at the Royal Academy of Visual Arts in Amsterdam and fell in love with landscape painting. 4. Post-Impressionism was an early influence. A groundbreaking painter in his own right, Dutch Luminist Jan Toorop introduced Mondrian to Post-Impressionism, and the impact this introduction made can be seen in how Mondrian’s landscapes transformed in his 30s. Bold colors and brushwork came in along with the pointillism technique made famous by Georges Seurat of A Sunday on La Grande Jatte —1884 fame. 5. Cubism came before De Stijil. When Mondrian moved to Paris in 1911, he was struck by the Analytic Cubism of Georges Braque and Pablo Picasso. Mondrian began to experiment in the form, abandoning the bright colors of his Post-Impressionist phase for more muted tones. However, rather than attempting the three-dimensional depth of Cubism, Mondrian was striving for a 2D representation that still signified his subject matter. 6. His passion was abstraction, but his day job involved the opposite. Those viewers who don't see the appeal of De Stijil might wrongly assume Mondrian could not create more complex art, but he was an accomplished artist in several arenas to support his abstract work. At various points in his career, he gave drawing lessons, sketched detailed images for scientific studies, and painted reproductions of great works for museums. 7. His most famous works were created after World War I.
Mondrian had been living in and loving Paris before the war, but when the conflict hit his new home while he was away visiting family in the Netherlands, he didn't dare return to a France. Once the fighting ended, Mondrian returned to Paris and created works that defined his unique branch of De Stijil, Neo-Plasticism. By 1925, these pieces were hotly sought by Europe's elite collectors. 8. Mondrian preferred living among his work. Instead of having a separate studio, he combined his home and workspace, gladly inviting friends over to lounge and philosophize among his works in progress. In his apartments in London and Paris, Mondrian took this system a step further, creating a sort of 3D version of his work with walls painted stark white, "with the odd patch of red." 9. He really loved Disney's Snow White. The first full-length cel animated feature film enchanted this intellectual artist after he saw it in the spring of 1938 with his brother in Paris. When he moved to London that September, he began to send his brother postcards decorated with clippings from the film's advertisements, and written in character as Snow White's dwarves. In one card, signed by "Sleepy," Mondrian wrote of his adventures in his new home: "Landlord has had my room cleaned by Snow White and the squirrel has whitewashed the walls with his tail." 10. He loved jazz music but was an abysmal dancer. Forget the stodgy image of the painter lost in thought and his harmonious abstractions. Though often described as an introvert, Mondrian reveled in the jazz scene of London, tearing up the dance floor with American socialite and art collector Peggy Guggenheim. Despite his enthusiasm, mutual friend Miriam Gabo, wife of the Russian sculptor Naum Gabo, remembered, "[Mondrian] was a terrible dancer … Virginia [Pevsner] hated it and I hated it. We had to take turns dancing with him." 11. Hitler believed he was a Degenerate. In 1937, two of Mondrian's pieces were included in Hitler's Degenerate Art exhibition, putting Mondrian on a Nazi blacklist. "The great danger for us," he wrote to a friend before fleeing Europe, "is about our work; might the Nazis come in; what then?" Mondrian didn't wait to find out. After narrowly surviving the London blitz on September 7, 1940, he escaped Hitler's reach by moving to New York. 12. Moving to America sparked a new chapter in his art. In New York, the art world’s elite embraced Mondrian. He befriended the American Abstract Artists, and former dance partner Peggy Guggenheim became a dedicated supporter and exhibitor of his works. The energy of his adopted home inspired new complexities in his paintings, like double lines, and lines no longer made of black but of vibrant yellows, like 1943's Broadway Boogie-Woogie, arguably his most famous work. Sadly, this chapter was cut short when Mondrian died of pneumonia in 1944 at the age of 71. 13. Mondrian's works inspired two schools of modern art. Gone but not forgotten, Mondrian and the De Stijil he made famous have gone on to influence other forms of art. The German Bauhaus movement focuses on functionality and efficiency of design, and shows Mondrian's fingerprints in its simplified lines and color theory. Minimalism arose in 1960s New York, its geometric forms and purposefully narrow color palette harkening back to Neo-Plasticism. 14. He's also inspired fashion. Color blocking has been an element embraced from runways to sidewalks to concert stages. In 1965, French fashion designer Yves Saint Laurent designed six cocktail dresses he called the Mondrian Collection. Each was a simple shift form in white, with black lines and blocks of color, making its wearer a living work of art. Mondrian's influence had another major moment with the rise of the American rock band the White Stripes. 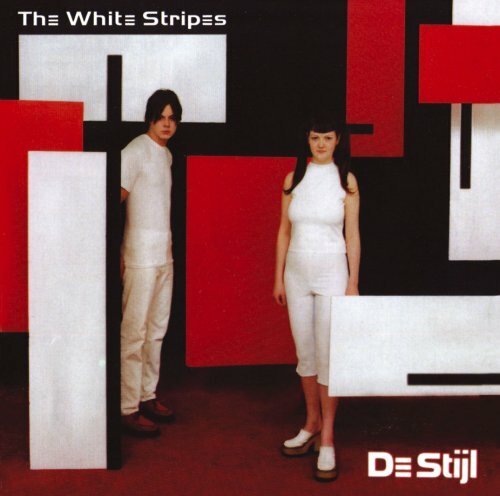 Not only did the duo of Meg and Jack White perform uniformly in outfits of blocked red and white, but they named their second album De Stijil, and celebrated the movement in its cover. 15. He's even inspired computer programmers. Mondrian has been so influential to computer science that programmers have actually scuffled over tributes to him. To pay tribute to the abstract artist whose paintings he believed his esoteric programming language resembled, David Morgan-Mar wanted to call his creation "Mondrian." But Martin Theus had already selected the name for a general-purpose statistical data-visualization system. Morgan-Mar went with "Piet" instead, lamenting, "Someone beat me to it with a rather mundane-looking scripting language. Oh well, we can't all be esoteric language writers I suppose."